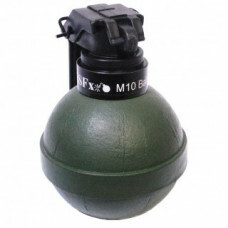 The M10 is the TLSFx 3rd Generation ball grenade with Dried Pea payload is designed for the airsoft player after the most realistic and reliable ball grenade on the market today. Modeled on the current ball grenades as used by armies around the world. Manufactured with TLSFx Byotechnics® body it gives the grenade a tough, realistic look plus the spoon handle of adds authentic looks and safety to the ignition system. There is no doubt that the M10 add to any MilSim or airsoft skirmish experience. Holding the lever against the palm of the hand the safety pin is twisted to unlock from the safe position and then pulled out. The now live grenade can now be thrown. The short fuse activated as soon as the lever leaves the hand. When detonated, the durable, water resistant finish casing will split, with a crack, covering the area with a cloud of biodegradable peas (Other payloads are available). Tag your photos using #TLSFx_M10 on Twitter and see them here. The natural evolution of the ever popular TLSFx Thunderflash, the M12 Distraction Canister is the co..